James K Polk was the 11th President of the United States who served in office from March 4, 1845 to March 4, 1849. What was the life of James K Polk like? The short biography of President James K Polk covers important information and facts about his early life, his family, career and the famous events and achievements of his political life. 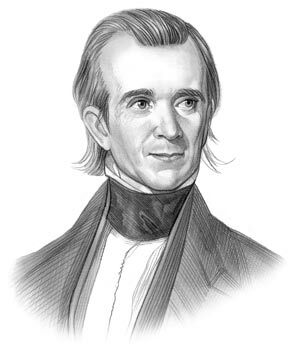 Our short biography of James K Polk provides an interesting and easy way to learn about the life of the President. The following important facts provide a fast overview of important facts about President James K Polk. Facts and Info: James Knox Polk was the 11th president of America and is best known for his policy of expansion which added Texas, California and other territory to the U.S. Polk believed in the westward expansion of the nation at any price and that the ideal of expansion was the fate of the nation. The President believed it was a 'Manifest Destiny' for the country. For additional info refer to 20 Facts about James Polk. Facts and Info: James Knox Polk was born on November 2, 1795 in Mecklenburg County, North Carolina. He was named after his maternal grandfather, who was a militia captain during the American Revolution and also took his mother’s family name. Polk was a distant relative of John Knox who was the leader of the Protestant Reformation in Scotland openly called for the execution of Mary Queen of Scots. James Knox Polk died on June 15, 1849 in Nashville, Tennessee. Facts and Info: The career of James Polk included the roles of Lawyer, Politician and Statesman. He was well educated at the University of North Carolina. James Knox Polk also had military experience in the Mexican War. He became the 11th president of America in 1845 and served for 4 years until 1849. James Knox Polk was the only president who was also the Speaker of the House of Representatives. Facts and Info: James Polk married Sarah Childress on January 1, 1824 but sadly had no children. Sarah was the 12th woman to serve as First Lady. Sarah was well educated for a woman of her era and she helped her husband with his speeches, gave him advice and played an active role in his political campaigns. Facts and Info: James Polk belonged to the Democrat Political Party. He was 49 years old when he was inaugurated as the 11th president. Inauguration is a president's swearing-in ceremony. In 1849 James Polk was the first president in office to have his photo taken. George M. Dallas stood as the Vice president. For additional facts refer to his Presidential Cabinet members. Short Biography of James K Polk: What he was like! Facts and Info: James Knox Polk was a sturdy man standing 5 feet 8 inches in height. He had unruly black hair which turned grey as he aged, grey eyes and a large nose. He was an introvert and social occasions were often quite difficult for him as he did not enjoy small talk. He enjoyed his work and was described as a workaholic. He owned slaves which was common during this era. Facts and Info: During his lifetime he played a key role in important events of the era. James Polk was in office for the duration of the Mexican War and was instrumental in the acquisition of California and Texas from Mexico. Facts and Info: During his life James Polk suffered from various health problems including kidney stones, sterility, and debilitating diarrhea. He died of cholera at the age of 53, just 103 days after he retired from the presidency. During the 1800's, cholera raged through the United States. It is a bacterial disease that causes diarrhea, vomiting, and leg cramps. Facts and Info: James Polk died of cholera morbus, resulting in debilitating diarrhea and dehydration, on June 15, 1849 in Nashville, Tennessee. He was buried in a tomb on the grounds of the Tennessee State Capitol in Nashville, Tennessee. The tomb was moved to this location in 1893 after his home at Polk Place was demolished. The short biography of James K Polk provides a fast overview of the key facts and events about his life and the accomplishments of his presidential term in office. The following James K Polk video enables you to sit back and listen to the history of his personal and political life - a useful educational resource for kids, children and schools learning about the life of President James K Polk.